Keywords should form the basis of your search and social marketing campaigns. “Keywords” doesn’t mean industry jargon. Keywords are the words your users and customers are using in search engines, social networks, review sites, etc. to find more information about a topic they’re interested in. Aiming to reach a customer looking for a new car? They’re probably using keywords that relate to the brand or type of car they’re looking for. So, as you develop your keyword strategy, you should be aiming for those types of keywords. How do you find the right keywords that will generate traffic and are related to your business? Ideally, you’d pick keywords that will surface your web page(s) in search engines and social networks–provided you have the right content. How do you get there? The answer is by using keyword research tools. Keyword research tools will help you to identify relevant, high-traffic keywords that you should be using in the content of your website and other owned media (your LinkedIn Company page or blog, for instance). Below, Style Techie compares two free tools to help you do just that. Google is the search engine, the dominant player in the field that isn’t going to cede its ground any time soon. It also provides a variety of free tools to help both individuals and businesses navigate through its search engine landscape. One of these is the Google AdWords Keyword Tool. To use the Keyword Tool, all you have to do is type in the keywords or keyword phrases you are considering. For instance, if you want to research the keyword “used cars,” type that into the designated field and click Search. 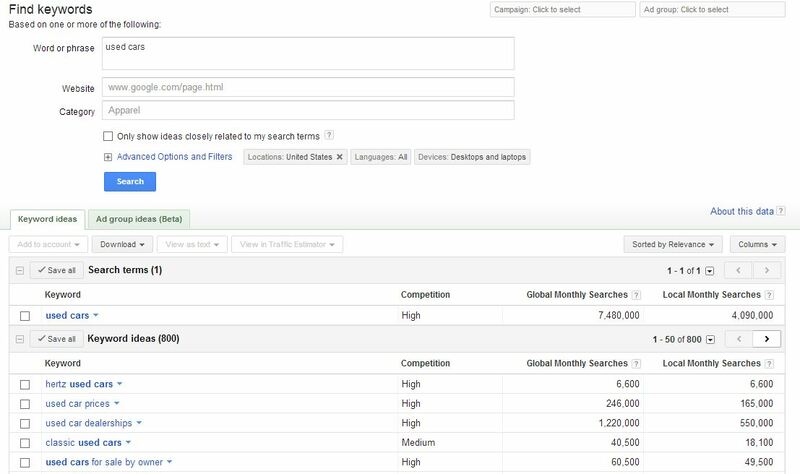 Google will show you information such as the relative competitiveness of that keyword (how easy it will be to place in a high-ranking position on the first search engine results page); global monthly searches (how often people everywhere searched for that keyword); and local monthly searches (how often people search for that keyword in the location and devices you selected). Plus, Google’s Keyword Tool will also generate a list of related keywords, giving you more ideas about other search terms you should consider for your keyword strategy. Best of all, everything is completely free. SEMrush is a software program that “collects massive amounts of SERP [search engine results page] data for more than 95 million keywords and 45 million domains, including: AdWords ad copies and positions, organic positions for domains and landing URLs, search volumes, CPC [cost per click], competition, number of results, and so much more.” With SEMrush, you can also search trends, competition, and campaign spend. If you want to know what your competitors are doing, SEMrush is the tool to do so. Though it is a paid service, SEMrush does offer some features that can be accessed for free. For example, if you enter your website (or the website of a competitor) into the tool, it will lead you to a dashboard where you’ll be provided with analytics such as amount of web traffic, the keywords (organic and paid) driving visitors to your site, other websites linking to your site, and more. In order to see more data, you’ll have to upgrade to the paid version. But, SEMrush does give you a good overview of how you and your competitors are comparing in the search engines. Should You Pay for a Keyword Research Tool? Both the Google AdWords Keyword Tool and SEMrush offer great features for keyword research. And, these two are just a few of the many keyword research tools out there. But, I will say that using the Google AdWords Keyword Tool is always a solid start for any keyword strategy you may have. Since there are so many tools available that are free or offer free features, paying for one may not be all that necessary. What keyword research tools do you use? Share in the comments section below!